(Bloomberg) -- The future of the oil market may resemble the past -- specifically the 1990s -- according to Goldman Sachs Group Inc.
That’s when prices remained steadily in backwardation, a market structure where near-term futures are costlier than later contracts -- reflecting tight supplies in the present and ample barrels further out, analysts including Damien Courvalin wrote in an April 8 report. Goldman also raised its second-quarter forecast for global benchmark Brent crude to $72.50 a barrel from $65, and said a rally that’s taken prices over $70 is reflective of a larger deficit than it predicted. OPEC’s cuts, an acceleration in global economic activity, tighter U.S. oil sanctions on producers such as Iran and an only moderate gain in shale production will continue to squeeze supplies through 2019, according to the bank. Click here for more on Goldman’s price-forecast changes. Brent futures traded little changed at $71.11 a barrel as of 10:59 a.m. in London. West Texas Intermediate, the U.S. benchmark, was up 0.4 percent at $64.63 a barrel in New York. While a risk-on investor sentiment and the threat of disruptions may drive spot prices even higher, Goldman expects them to decline gradually from this summer as production from shale fields and the Organization of Petroleum Exporting Countries increases. “We therefore find more compelling opportunities for corporates and investors in timespreads, differentials and product cracks,” the analysts wrote. This outlook supports the bank’s expectation of further backwardation. 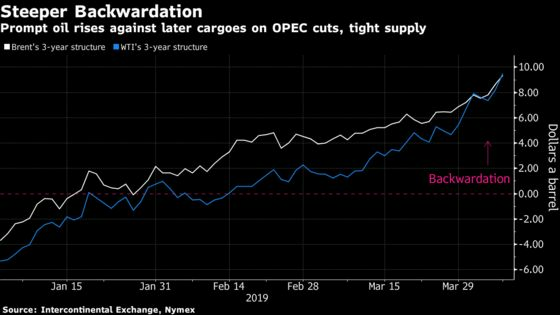 Goldman said the key to a successful implementation of OPEC’s cuts will be a shift over the coming months to a coordinated exit strategy of rising production. The “anchoring” of long-dated prices will be a key metric to assess whether the curbs have overshot and backwardation is sustainable, it said. “Any meaningful rally in three-year forward prices -- which so far have been anchored at $55 a barrel for WTI -- would provide an opportunity for more aggressive shale growth without sacrificing returning cash to shareholders,” the analysts wrote.